Here at Vow Muse, we love podcasts. We listen to them while walking to work, driving in the car, and exercising; essentially, if we’re not sitting still doing one thing (like writing wedding vows), we’re listening to a podcast while we do something else. Which is why the opportunity to be on a podcast is pretty exciting to us! 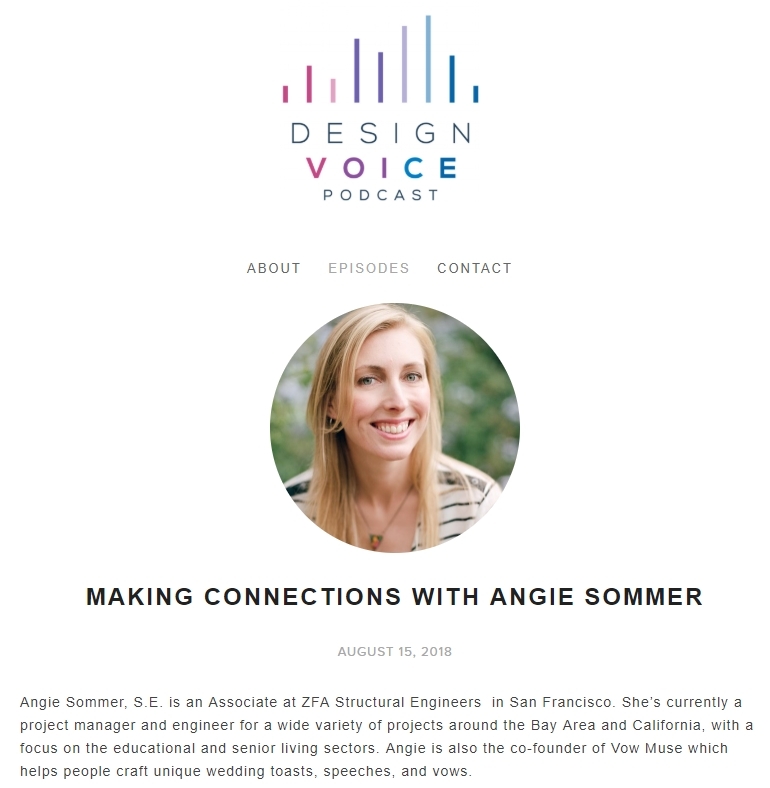 In the words of Catherine Meng, the host of Design Voice Podcast and an architect at DLR Group | Kwan Henmi in San Francisco, the show “seeks to elevate and amplify those voices of women in the architecture, engineering, and construction professions.” Each episode features a conversation curated by Catherine with a woman who shapes the built environment in one way or another. Catherine discusses her guests’ unique takes on the state of the profession, stories of career journeys, and aims for the podcast to serve as a source of education, inspiration, and empowerment. All of which Vow Muse could get behind in any circumstance. But, over the summer, Angie—Vow Muse cofounder and a structural engineer by day—sat down with Catherine, two microphones, and some bubbly water and chatted about what inspired her to become a structural engineer, her roles in organizations that work to develop and advance women as leaders, and, of course, how she became a wedding vow writer with this unexpected side business of hers, Vow Muse. And—spoiler alert—you’ll even find out that she’s never seen the movie Bambi. Little-known fact, for the win.